There are plenty of reasons why travellers and adventurers head on to Australia’s precious heritage-listed island, Fraser Island. Aside from its white sandy dunes, colourful Aboriginal history, unique wildlife and exciting tour activities, Fraser Island’s more than 100 freshwater lakes also attract visitors worldwide. And the most popular among them is Lake Mckenzie. Interested to know why? 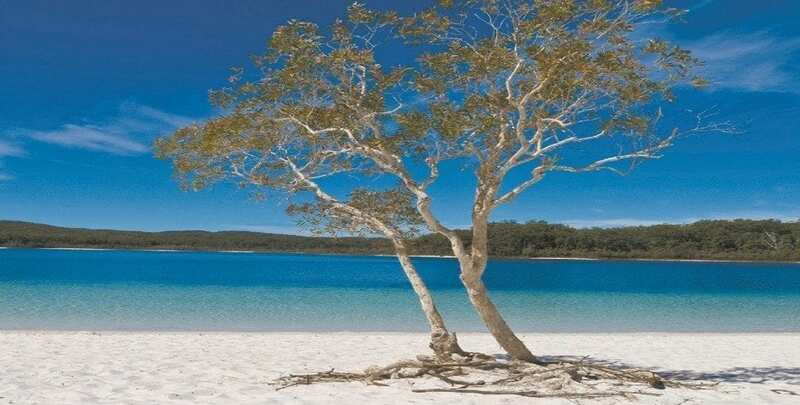 According to Australia’s Department of Sustainability, Environment, Water, Population and Communities, Fraser Island is home to 40 perched lakes or half of the world’s perched freshwater dune lakes, Lake McKenzie being one of them. What makes perched lakes unique is that the waters do not come from streams or flow to the ocean, but are actually rainwater. Lake McKenzie measures over 150 hectares with a depth of 5 metres, which would make it feel like you’re swimming in a pool, only much larger and cleaner. Many of us probably have bad impressions of lakes because of how they were depicted in the movies – murky, mysterious, and a place where dark, vicious creatures thrive. But Lake McKenzie definitely showcases the opposite of that. Olivia Pozzan of BBC Travel offers probably one of the best descriptions of Lake McKenzie: “The water is a stunning vivid blue, and the pure-silica sand is soft underfoot. The sand is so fine it is ideal for skin exfoliation. The slightly acid water, from decaying plants, limits the viability of aquatic life but in no way affects the pleasure of a well-earned swim. It is the lake’s fine, powdery white sand that presents the waters’ stunning clarity. Also, you need not fear of any creatures dragging you under because not many species can survive here due to the lake’s high acidity levels. It is important to remember, though, travellers should avoid using sunscreen, soap, or oils when swimming in Lake McKenzie as they are considered pollutants. There are a number of areas where day-trippers and adventurers can experience camping on Fraser Island. “The more developed camping areas are located at Central Stations, Lake McKenzie, Lake Boomanjin, Waady Point, Dundubara and Wathumba. And if you’d like to try camping on Fraser Island, then Lake McKenzie would be one of the best spots to put your tent up. As they say, you can never fully enjoy the majestic beauty of a destination unless you’ve seen it in its entirety, and of course, under the stars. Basic facilities that are available on designated camping areas include public toilets, showers, car park, and barbecue facilities. But be sure to secure a camping permit prior to your arrival on Fraser Island. For those who want to enjoy a serene, family bonding with a breathtaking backdrop of nature, enjoying a picnic by Lake McKenzie would be a perfect idea. There are picnic tables and picnic areas in the area for visitors. Not only will families get to enjoy hearty meals, they’d also get to bask and feat on the lake’s scenic views. If you key in “Lake McKenzie” on Google, you’d immediately be greeted by a plethora of photos and images showcasing the wondrous beauty of the lake. But this jewel is more than just picture-perfect. We’d like to share what Chloe Walsh of Exploration Online UK so beautifully wrote: “Lake McKenzie is an expansive lake…but what immediately hits you is the vibrant colour. The water hitting the shore is crystal clear and aquamarine in colour. Then, suddenly and in a perfect straight line…the lake is the colour of blue ink…The sand is almost entirely silica, but what that means to us is that it is like walking on warm, slightly melted ice cream. ” It’s Lake McKenzie captured in poetry. If these aren’t enough reasons to convince you, then we don’t know what will! We got one piece of good advice for you, though: stop reading and book your Fraser Island trip now, and don’t forget to add Lake McKenzie on your itinerary.